By buying this product you can collect up to 130 loyalty points. Your cart will total 130 points that can be converted into a voucher of Rs. 13.00. According to a study done by the Department of Aquataculture in Taiwan, spirulina shows significant immune-boosting properties. On & On Spirulina capsules are Pure Veg Capsules (and NOT Gelatin Capsules). Most of us remain uninformed about the nature of ingredients that makes up the capsule. Many of us knowingly or unknowingly consume non-veg shiny shells derived from cows, pigs and other animals. On & On Spirulina is not only rich in its nutrient profile, but is also made with Pure Veg Capsules and is absolutely safe for consumption. In today"s fast forward life, when often the major nutrients are lacking Spirulina is the simple solution for well being. 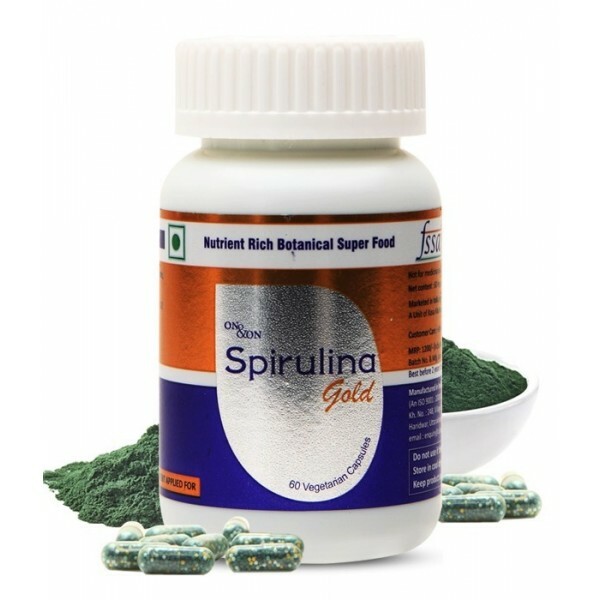 Scientifically, Spirulina is simple one-celled microscopic blue-green algae with the scientific name Arthrospira platensis. Under a microscope, spirulina appears as long, thin, blue-green spiral threads. 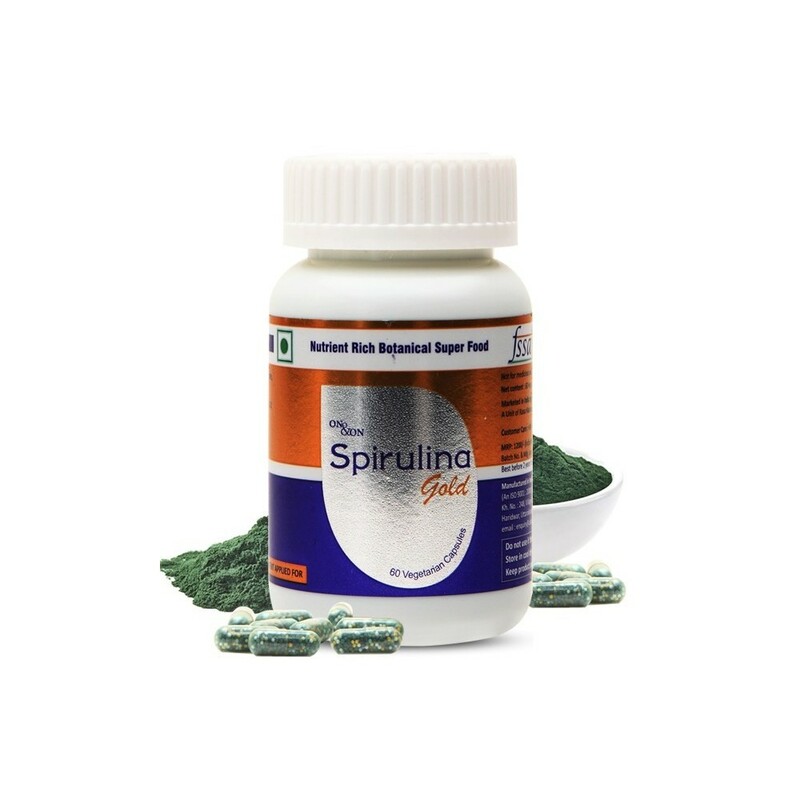 Spirulina is a bliss to human being for various reasons and is found in many freshwater environments, including ponds, lakes, and rivers. It thrives best under pesticide-free conditions with plenty of sunlight and moderate temperature levels. It is all natural way for overall wellbeing. Candida If you have an autoimmune disease such as Crohn's disease, chronic fatigue syndrome, Lupus or fibromyalgia, chronic Candida yeast can both cause and worsen your symptoms. Spirulina has been shown to encourage and support the growth of healthy bacterial flora in your gut, which can help keep Candida overgrowth under control. If you suffer from seasonal or perennial allergies, you're not alone. Millions of people are allergic to pollen, ragweed, dust, mold, pet dander, and a myriad other environmental contaminants, ensuring the makers of Kleenex will always stay in business. Unfortunately, many people who have allergic rhinitis treat it with prescription and over-the-counter (OTC) drugs that often do more harm than good. Antihistamines are designed to suppress your immune system, which leads to decreased resistance to disease and dependence on the drug. Certain asthma drugs have been linked to serious side effects as well. This is where natural methods such as the use of spirulina come in. According to one study, patients treated with spirulina reported relief of symptoms commonly associated with allergic rhinitis, such as nasal discharge and congestion, sneezing and itching, when given spirulina. In one placebo-controlled study, taking spirulina seemed to reduce a precancerous lesion known as leukoplasia in people who chewed tobacco. Lesions were more likely to go away in the spirulina group than in the placebo group. Preliminary evidence suggests that spirulina may help protect against liver damage and cirrhosis (liver failure) in people with chronic hepatitis. Spirulina; is the richest source of Omega Fatty Acids, Protein, vital minerals and Vitamin B Complex Benefits are. â€¢ For mothers-to-be, DHA can help support a healthy pregnancy. â€¢ For infants, DHA is important for brain and eye development. â€¢ For children, DHA is important for ongoing brain and eye development. â€¢ For adults, DHA supports brain, eye & heart health. DHA is used as a supplement for premature babies and as an ingredient in baby formula during the first four months of life to promote better mental development. This practice probably started because DHA is found naturally in breast milk. DHA is used for treating type 2 diabetes, coronary artery disease (CAD), dementia, and attention deficit-hyperactivity disorder (ADHD). Bioflavonoid is a generic term used to describe biologically active members of the group of plant-derived compounds known as flavonoids. Bioflavonoids were first discovered in 1936 by Nobel-prize winning scientist and vitamin C research pioneer Albert Szent-Gyorgi, who originally named the group of compounds "vitamin P." Since then, over 4,000 flavonoids have been identified and classified according to chemical structure. Bioflavonoid supplements are available as individual flavonoids, such as quercetin (derived from onions), and as multiple bioflavonoid complexes (derived from citrus fruits), which are often combined with vitamin C. Compounds commonly featured in citrus bioflavonoid supplements include hesperidin, rutin, naringin, and quercetin.